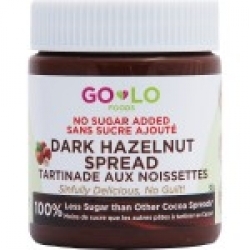 Since I've stopped eating sugar, I've been wishing for a sugar-free equivalent of Nutella. So when I saw this spread on sale, I had to try it! It tasted good, very close to the taste of Nutella. But something was missing: sugar. It is sweetened with Erythritol, which is an artificial sweetener. Artificial sweeteners can be just as bad as refined sugar, because they are a concentrated sweet with no surrounding components to help your body digest sugar (dried fruit, for example is sweet but is wrapped in fibre). I would prefer if they used a more natural sweetener like apple juice. Overall, it tastes good, but I wouldn't eat it often.